Talented 21-year-old Tobermore rider Adam McLean has joined the quinnstheprinters.com Team by IMR for the 2018 season. The gifted McLean will have a full complement of machinery for the 2018 international road races where he will campaign a BMW S1000R in Superbike plus a Yamaha YZF-R6 for Supersport races. McLean has been an impressive performer over the last two seasons on the road race scene, but especially at the international events. He took a superb fourth position in the second North West 200 Supersport race and third in the Supertwin race at the Ulster Grand Prix. He also made his Isle of Man TT debut in June, winning the coveted Newcomers Trophy, finishing 18th in the opening Supersport race in which he lapped at 120.644mph, the fifth fastest lap by a newcomer on a 600cc machine. He was also a consistent front-runner at Olivers Mount, Scarborough taking regular podiums in the Supersport and Supertwin classes and finished third, fourth and fifth in the Irish Road Racing Supertwin, Supersport and Moto3 championships. McLean said: "I'm really looking forward to working with quinnstheprinters.com by IMR in 2018 and am very grateful for the opportunity. I'll be riding top class machines with a superb infrastructure behind me, which will hopefully enable me to be successful and allow me to build on my 2017 results. I can't wait to get going." 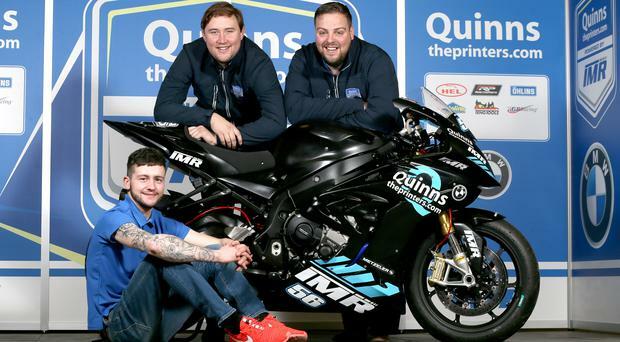 Ian Moffitt, Team Principal of quinnstheprinters.com by Team IMR, added: "It's fantastic to have signed Adam for the 2018 season. Given our initial focus on the British Championship we feared we had missed out on signing a quality road racer. However having learnt that Adam was available and after a discussion with Peter Bradley, MD of quinnstheprinters.com, we were able to come to an agreement on running Adam in the international road races." Meanwhile, the accolades keep coming for Jonathan Rea following the announcement that he has been named the 2017 BBC Northern Ireland Sports Personality of the Year. The award comes hot on the heels of Rea's runner-up spot in the overall BBC Sports Personality of the Year Awards on Sunday. It was a unanimous decision by the judges following the Ballyclare rider's record-breaking year - creating history by becoming the first person to win three successive World Superbike championships. Picking up the award, Jonathan said: "It's incredible. Like I say time after time, our country punches above its weight in all sports, not just motorsport, so, to be recognised as part of all sports put together, this is an award that really means a lot. Thank you very much." After receiving his MBE earlier this year, Rea reflected: "Most of my childhood here growing up racing in youth motocross were the best days of my life. So coming back home and always seeing the support I have here and on social media, this award means a lot. It's a big thing." Jane Tohill, Executive Producer Sport BBC Northern Ireland, said: "It's always difficult to pick a winner. We are lucky to have so many talented sporting stars in Northern Ireland who excel in teams and individually. But Jonathan's success this year means he is a worthy winner. "Jonathan's result at the Sports Personality awards on Sunday night also reflect the respect he has across the UK, for what he has achieved, and, how he has achieved his success. So we're really pleased to award him the 2017 BBC Northern Ireland Sports Personality of the Year."